CET - As we've noted many times in the past, there are a lot of community theatre options in the greater Iowa City area. But the most pure version may be one of you have never heard of: Combined Efforts Theater. Community theatre is about involving the community to create live theatre. Combined Efforts demonstrated that wonderfully last weekend with their production Love at the County Fair written and directed by Janet Schlapkohl. Unfortunately, the show only ran one weekend. Hopefully, future shows will have longer runs. 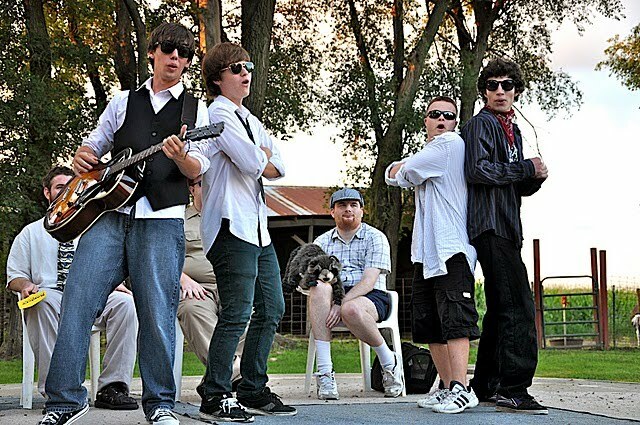 The show was performed at Country Camp, a farm that holds different youth camps over the summer months. A couple of months ago, I had the chance to see Working Group Theatre perform an original show, Odysseus, Iowa, at Country Camp. Like that show, Love at the County Fair is promenade theatre, where the audience moves from one location to another to see the various scenes of the show. If I have one criticism of this show, it's that the audience was asked to move too often. I wish the scenes had been longer and there was always a clear reason why a scene was being performed in a particular location. However, one wonderful aspect of this type of theatre is how involved the audience feels in the production. We do not sit back statically and watch the show. We move, directed by two of the actors, to each location. As we move, we have the opportunity to make comments to our fellow audience members, chuckle together at a moment in the last scene or perhaps predict what might happen next. This creates an audience community and truly enriches the show and the experience. I strongly recommend all of the local theaters place a call to Ms. Schlapkohl and inquire about producing a show in this unique venue. The actors of this show come from all corners of our community. Rip Russell starred as a Gulf War vet returning to his hometown to find the girl he left behind so many years before. Kathy Maxey played the object of his affection, a woman who was trying to move on with her life after a divorce. Both brought honest and touching performances. And they sang, too! I knew of Ms. Maxey's singing talents, but Mr. Russell was a welcome surprise. Another interesting surprise was the rooster who decided to perform a duet with Mr. Russell. Such are the possibilities of live theatre... on a farm. 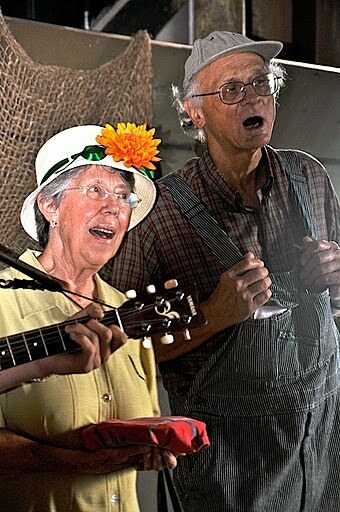 Evelyn Stanske and Mary Haaf Wedemeyer, two veteran ICCT actors, portrayed Hog Callers to hilarious effect. Nicholas Johnson and real life wife Mary Vasey were hosts of the fair. They kept the action (and the audience) moving. Johnson's funny and touching ode to his wife's fallen pie was a highlight of the evening. We were also treated to dueling mother-daughter dancing duos hilariously performed by Katherine Smith, Taryn Hansen, Ryann Sirois, and Olivia Moss. And of course, because this is Combined Efforts, there were various actors who have special needs. I am going to admit to something very publicly that I hope you will forgive. I had real concerns about how a show with actors who have special needs would come off. I feared I wouldn't be able to see past the issues of the actors and let myself get into the story. What I came to realize in watching this show is that issue is one of my making. From scene one, I was completely into the mischief and machinations of these fair goers. The entire cast threw themselves into this show and thoroughly entertained the audience, including me. So often in theatre or TV or movies, if we see a character with a special need, that's what the story is all about. How utterly refreshing to see a show where those issues are just part of the person, rather than taking over the person. We need more theatres like Combined Efforts who are willing to be so accepting and welcoming in their casting. What a wonderful opportunity to teach our children to open their minds and hearts to all people no matter what issues they have which may make them different. And speaking of kids, there were also many talented youthful performers in the cast. The Mall Girls - Anna Sheffield, Monica Moss, Tayvia Hansen, Emily Merritt and Alannah Walterhouse - and the Renaissance Warriors - Phil Buatti, Cole Hotek, Peter Lynch, Wyatt Bettis, and Avery Mossman - certainly embodied their generation well. 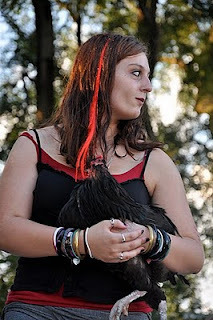 The goth girl poetess (Hayley Musser) had me laughing with her poem about a rooster and an axe. The talented Lark Christensen-Szalanski made the most of her stage time as the Lemonade Stand Worker. Particularly outstanding was Jessica Sheffield, who played the daughter of Kathy Maxey's character. Miss Sheffield has a wonderful stage presence and a liveliness that keeps your attention. Here's hoping she does more shows in the future. Combined Efforts Theater is such an important part of our community. We are lucky to have individuals like Janet Schlapkohl who are willing to do what too many of us are not - be completely inclusive. The next time Combined Efforts puts on a show, I urge you to check it out. They are the purest community theatre - of the entire community, by the entire community and for the entire community.